This marks our our 10th year of doing this. And by “this”, we mean using data, logic and reason to support the very basic conclusion that infinite growth on a finite planet is impossible. Surprisingly, this simple, rational idea -- despite its huge and fast-growing pile of corroborating evidence -- still encounters tremendous pushback from society. Why? Because it runs afoul of most people's deep-seated belief systems. Our decade of experience delivering this message has hammered home what behavioral scientists have been telling us for years -- that, with rare exceptions, we humans are not rational. We're rationalizers. We try to force our perception of reality to fit our beliefs; rather than the other way around. Which is why the vast amount of grief, angst and encroaching dread that most people feel in western cultures today is likely due to the fact that, deep down, whether we're willing to admit it to ourselves or not, everybody already knows the truth: Our way of life is unsustainable. In our hearts, we fear that someday, possibly soon, our comfy way of life will be ripped away; like a warm blanket snatched off of our sleeping bodies on a cold night. The simple reality is that society's hopes for a "modern consumer-class lifestyle for all" are incompatible with the accelerating imbalance between the (still growing) human population and the (increasingly depleting) planet's natural resources. Basic math and physics tell us that the Earth's ecosystems can't handle the load for much longer. The only remaining question concerns how fast the adjustment happens. Will the future be defined by a "slow burn", one that steadily degrades our living standards over generations? 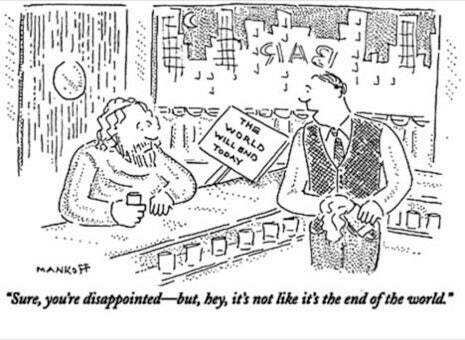 Or will we experience a sudden series of sharp shocks that plunge the world into chaos and conflict? It’s hard to say. 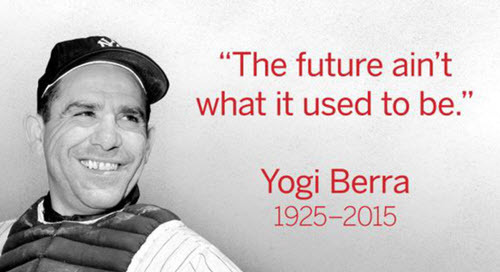 As Yogi Berra famously quipped, “It’s tough to make predictions, especially about the future.” So, it's left to us to remain open-minded and flexible as we draw up our plans for how we’ll personally persevere through the coming years of change. Trends can be expected to continue until they change. Therefore making "predictions" on trends is like making a "prediction" about which way an already tossed ball will travel. It's not really a prediction at all, but a statement of observed data. No, the future certainly isn’t what it used to be. Once it was a place in which you could invest towards your hopes and dreams, confident that conditions would be better for your children than they were for you. That’s no longer the case. The defining trends in play are all working to degrade, rather than enhance, our future prospects. “In general, I regard the future as a multitude of possibilities, but most of them don't look good,” Elias Schwartzman, 29, a musician, told me. “When I'm at retirement age, around 2050, I think it's possible we'll have seen a breakdown of modern society.” Schwartzman said that he saw the future as encompassing one of two possibilities: an apocalyptic “total breakdown of industrial society,” or “capitalism morphing into a complete plutocracy.” “I think the argument can be made that we're well on the way to that reality,” he added. Wood, 32, a political consultant, told me via Twitter that she felt similarly. “I don’t think the world can sustain capitalism for another decade,” she explained. “It’s socialism or bust. We will literally start having resource wars that will kill us all if we don’t accept that the free market will absolutely destroy us within our lifetime [if] we don’t start fighting its hegemony,” she added. As someone who tracks economic, environmental and energy data closely, these views are neither surprising nor really debatable. They are merely trend extrapolations, which are difficult to dismiss. What the older generations don't yet understand is that the economic and social models that rewarded them so richly are not doing the same for younger folks. In fact, those old models are visibly breaking down. And confidence in them is failing, too. Younger people are increasingly seeing that the model of extractive, exponential growth (which is often errantly termed “capitalism” when, as practiced, it should be termed “corporate socialism”) has no future. And of course, they are right. If we're willing to entertain the possibility that infinite exponential growth is impossible, and we extrapolate from there, what sort of economic trajectory would we expect to see as growth peters out? Exactly the sort we see in the above chart. Lower and slower growth that finally peters out and then slips into reverse for the rest of the story. Sociologically, we’d expect people to be nervous, anxious, and scared as their dominant cultural narrative is increasingly revealed to be no longer viable. Ask yourself: is the world becoming calmer or more volatile? The rash of mass shootings, anti-establishment election victories, prescription drug epidemics, and returning nuclear war fears make the answer sadly obvious. Biophysically, we'd expect to see key resources and species populations depleting at alarming rates -- which we are. This is due to diminishing returns: nearly every planetary resource is getting harder and more expensive to obtain. Mars anyone? In a desperate attempt to mask the costs of of slower and lower growth, the world's central banking cartel has deployed its “one weird trick”: lowering interest rates to historic rock-bottom levels. This has allowed for more debt to be crammed into the system for a few more years, to keep the mirage of the party continuing for just a little bit longer. Perversely, the central banks are doing everything in their power to defend and propagate this unsustainable status quo, even though fourth grade math tells us it will surely end in ruin. How is it possible that this very simple observation eludes so many of those in positions of power? You’d have to be an intellectual yet idiot to hold the view that debts can forever compound at faster rate than income. 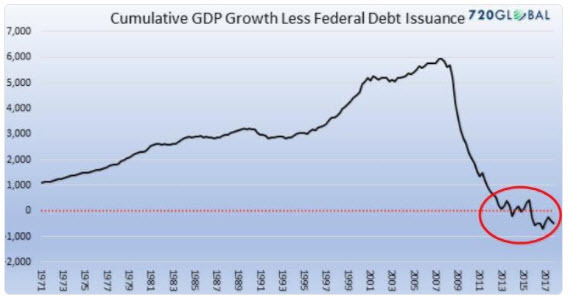 The US has been going deeper and deeper in debt simply to maintain the appearance of "economic growth". This whole illusion is being limped along for just a little while longer. For what purpose? And why? Both excellent questions without a good answer. You should be asking yourself what "success" looks like here. What's the end game? More growth? Okay, then what? More growth? Keep going along that line of thinking. Take as much time as you need. Clearly there's an end to that story somewhere. Growth ceases. Presumably smart people in power get this, too, although they'll never admit it publicly so as not to spook the herd. Looking at the number of very well-connected and wealthy elites busily arranging bolt-hole properties to retreat to 'just in case', they're already well ahead of the general public in preparing for the tribulations to come. All of which brings us to the very real prospect of war, as that has long been the favored path of politicians seeking to deflect public ire from their own policy failures. I worry that a major military conflict is dangerously close at hand. The ridiculous UK government narrative around the Skripal poisonings (which remains utterly illogical from start to finish) used to seriously degrade relationships between Russia and NATO has all the hallmarks of contrived political operation. Added to the brewing geopolitical risk is the very likely prospect of the bursting of The Mother Of All Bubbles. When (not if, sadly) that happens, it will be truly catastrophic to every financial market in the world, and especially damaging to the western economies. So the race is on. Will the bubble burst first? Or can the political class engineer a massive military distraction beforehand? Regardless of who “wins” that race, you need to be physically, emotionally and financially prepared for these outcomes. PeakProsperity.com's (free) What Should I Do? guide is an essential resource for those not yet fully prepped, as well as is our Self-Assessment. Yes. Things are that serious. If you're not yet an enrolled subscriber to PeakProsperity.com, please consider becoming one now. 2018 is looking to be the shoo-in candidate for "The Year Everything Changed". Interest rates are finally rising. Volatility is finally returning to the financial markets. Oil prices are threatening to finally return to the critical $70/bbl range. The populace is finally waking up to the extent of the abuse perpetrated on their safety, personal data, and civil liberties. The crypto bubble has finally burst. So many long-term trends that have defined the (false) sense of 'prosperity' over the past eight years are ending now. What ensues will be fast-paced disruption. By enrolling, you'll stay abreast of developments and be able to position yourself (and your wealth) accordingly, benefiting from our daily work to harvest and synthesize all the complex information so you don’t have to. You’ll support will also help our ongoing efforts to bring Peak Prosperity's alternative message and insights to a greater percentage of the general public, who desperately need this information to counter the "Don't worry, everything is awesome!" narrative prevalent in our captive mass media. In this vein, in Part 2: Everything Is Suddenly Deteriorating, Fast we analyze the recent whipsaw volatility that has broken out in the financial markets and explain why it, along with other markers we've been watching out for, indicates that the markets are poised to fall dramatically further from here -- whether war breaks out or not. But even if this is as far as you're going to read, please get your preparations in place and get ready to hold fast. Things are only going to get bumpier from here. I just watched the Chasing Coral, hard to believe we've lost approx 30% of the worlds coral reefs already and essentially all are expected to be gone in 30 years time. Just another unintended consequence of the way we conduct our systems. Given I'm around 40 years old, I expect to see lots of changes coming over my lifetime, some positive but Iikely the majority will be negative. I have a few friends down in Long Beach California from when I lived there '97 to '98. One works in the port of LA and secretly sleeps at his workplace onshore to avoid paying rent. He gets up every morning at 6 and walks away to his truck and then walks back later to make it look like he is coming from home. He says he understands things are ready to fall apart and that everything is just being propped up. He wants to move up north but he just doesn't know how, or can't get it together, to get out. He says everything seems like the playground scene in The Terminator, just before the nuke goes off. Chris, tell me you don't believe these shootings are genuine???!!! I wish Youtube hadn't deleted those thousands of videos; I could show you some that within 5 seconds would convince anyone that Orlando was a hoax, guaranteed. And those that remain in denial would experience some pretty intense cognitive dissonance. Hence the reason why Youtube deleted them. Is there anywhere I can upload videos like you can with images? Without getting deleted and marked by the NSA? I heard about this new D Tube site, which has rules preventing the host to just go around deleting videos it doesn't want shown. "...So many long-term trends that have defined the (false) sense of 'prosperity' over the past eight years are ending now. What ensues will be fast-paced disruption..."
I like what Nassim Taleb argues in this vein. He suggests we form our guesses about the future (and associated risks) based upon the scientific notion of normal distributions but the really impactful events in life are those that lay outside these ‘bell curve’ estimates and create what he termed ‘Black Swan Events’. Any number of Black Swan Events could send the variables that make up the complex systems discussed here sideways in totally unexpected ways. You certainly can't say we don't live in interesting times. Another great article, Chris. Thank you. Read the Fourth Turning. Don't just scan it or think you know the concepts from a summation. Really read it page by page and digest it. Then read all of Martin Armstrong's work. Then read all the prophecies from Billy Meier (and ignore the CIA disinformation campaign related to him and his work) to find out what's going to happen. It's possible to stop all this and change history but highly, highly improbable. In truth, what is happening is inevitable and it's all happened before, in this world and others, and it will happen again and again, in different ways, shapes, and forms. Yeah, block me and other opinions that don't completely fit your preferred narrative but also ask yourself why. Also, no matter how much you prepare, it will not be enough.
" no matter how much you prepare, it will not be enough. " of course preparation has its limitations, but does that justify doing nothing? as things unwind, having some "buffers" or cushions in place only makes the inevitable changes easier. this is no different then wearing a seat belt when traveling because crashes are a real possibility. So much material to digest. I’m sure Chris knows that, as bad as they look, his GDP charts are better than reality. Years ago, the Soviet Union crop reports were universally known to be fiction. Perhaps it’s not universally known, but many know that much of what US Government Agencies report is massively distorted, like unemployment, inflation and GDP. These distortions date back to the 1970s and the distortion has systematically increased over time. So look at the declining GDP charts above and realize that the real decline is massively steeper. I know Chris is aware of this because he is the one who brought it to my attention. Colonizing Mars was mentioned. Anyone who thinks we have the knowledge, technology or demeanor to do that should take a close look at Biosphere 2. For now, Earth is our only choice. If we continue to screw it up here, we are, well, screwed. 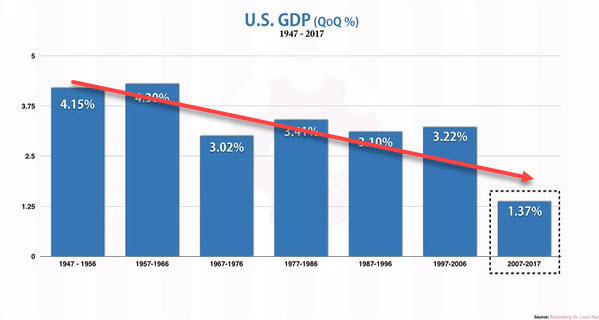 One graph in this article shows USA GDP clearly falling from 1947-2017. 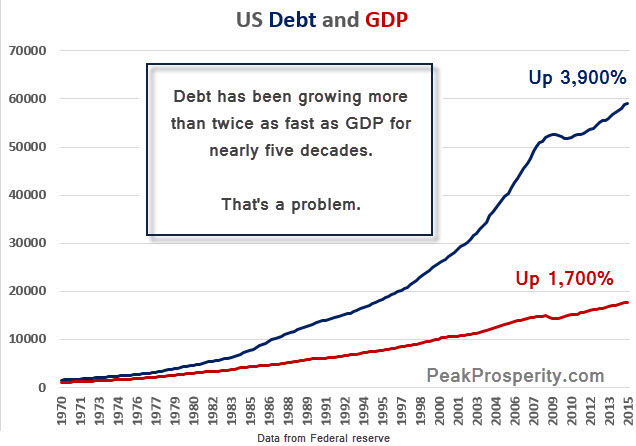 The one following it (US debt and GDP) shows GDP rising. ??? The first graph is showing *rates* of growth (expressed in percentage terms). So the economy might grow 3% a year, then 2.5% a year, and then just 2% year. The rate of growth is falling. The second graph is showing aggregate growth over time, finally expressed as percentage growth over that entire time. Example: If the economy started at 1000 in decade #1 but then climbed at 3% per year for 10 years, it would then be at 1,344. If it then grew from there at 2% for the next ten years, it would grown from 1,344 to 1,638 in aggregate terms...even though the rate had dropped from 3% to 2%. You'd see rising GDP in nominal terms but a falling rate of growth. Make sense? I know showing US Debt and GDP on a linear vertical axis gives an impressively bleak graph but it would be much more useful to show this data on a log vertical axis. That would allow visualizing the behavior in earlier decades and comparing it to the current time frame. The numbers for the 70's are so small (in absolute terms) that we can't see the relative behavior. Yes, and prepping helps you be mentally practiced and emotionally prepared for a change in context. If concern about our big problems was commiserate w the scope of those problems, it would dominate msm and overall conversation across the country. But it's not even close. By procrastinating so long we're pretty much committed to a bad ending. Environmentally, financially, economically, and I fear, socially. "What ensues will be fast past disruption". To me, that's the scariest thing about all this. Expect the majority of people, who are not mentally or otherwise prepared for any type of collapse, to be shocked at how fast and how far things can deteriorate. Their reaction is not likely to be "help thy neighbor", as Thom Hartmann points out typically happens in disasters. No, there's a good possibility cut throat behavior takes hold and we become our own greatest enemy. All while armed to the teeth. My preparation is increasingly less geared towards how to survive and more towards how to exit. Please don't see that as disturbing or depressing, as daily I gain better appreciation for the life we have (certainly the one I've had), and am fascinated and captivated by what is going on and how we're (not) responding. It's getting surreal, almost an out of body experience. Lost interest a few years ago in shows like Homeland and House of Cards, cause they can't compete w real life! I second "the lack of conern is my greatest concern"
Back during the during 2008 meltdown, people were at least talking about my hobbies seriously, things like gardening, food preservation, small livestock, etc. When things are good, most folks just believe the delusion, that things will continue as is, right, it's much easier. What's the old saying, when you have the choice between fantasy and reality, fantasy wins the day. My other major concern is the lack of infrastructure for a less energy rich world. Things like root cellars, locally grown produce, small livestock and close livestock processing facilities. What will transportation be like if we have intermittent fuel interruptions? How well will our current housing hold up if there is intermittent power outages, like water damaged basements and freezers off for days or a week. How resourceful are people(neighbors) in these situations? I've never lived in an apartment but what is the skill set of most American's, dismal at best. Most people will bow to the state to save them cause that will likely be the only choice. One only has to look at countries like Argentina and Greece and if real ugly, Venezuela. Not pretty, I'm not happy in my current location, would much rather be established in a less populated area. Optimistic that some trends will end. McMansions will have to end, replaced by much smaller zero net two story homes whose roofs are a solar collector. I don't know the doubling rate of permaculture students that become instructors, but they are out there and their numbers are no doubt doubling. Using permaculture practices will mean that the same nutrition now produced on a 100 acres can be equaled on 4 acres. That means that a 1/4 acre lawn could become a small farm. Senate majority leader is said to be introducing a bill in congress to legalize industrial hemp. When this happens the aforementioned zero net homes could be all built with 90% with hemp products. There is no end to the positive effects that this will produce. Planned obsolesce will have to end. incorporate that with a combination tractor (for your lawn say) and car or pick up truck that can tow a small RV (your first home in the future) all of which will last for a lifetime. I see this as already on its way. In the 50's a car might last around 100k miles, now 300k is achievable. Found this on Reddit the other day. This makes my blood boil, it's so stupid. There's nothing that makes me more annoyed than realizing I've bought something designed to break. Just make it properly and charge me reasonably. Might I suggest speed queen? The long answer is that you need to get laundry machines designed for businesses -- for example, laundromats. Yes, even your Maytag nowadays is engineered to break quickly and force you to buy again. It reminds me of the Epson inkjet printers that had a waste ink chamber to throw away expensive ink, and a counter. Even if you were able to empty the waste ink container yourself, if the counter had overrun, the printer would not work. The ultimate in "engineered to fail"... was "instructed to refuse to work". So anyhow, my parents were able to get a hold of a scratch-and-dent speed queen that was specifically not to be sold to consumers... laundry businesses only. Unlike others that lasted about a year and a half, that one is still going. Planned obsolescence and junk engineering/manufacturing have been with us for a long time. I'm a highly-mechanical guy, but appliances have always flummoxed me. All Hail YouTube! I've pulled off some surprising fixes on washer/dryers, and printers, etc., from watching some of the most amateur videos submitted to YT. And internet sourcing of parts is pretty easy and cost-effective. Gotta be willing to dive in though. And have your bandaids handy when taking apart your washer- lotsa sharp edges on those cabinets. Given our predicament, it is almost criminal the state of planned obsolescence in manufacturing. Ditto on trying to source true commercial gear....Aloha, Steve. Depending on the time of year, I either walk or cycle up to the local laundromat every 3 or 4 weeks. I get the laundry done in less than an hour and a half and don't have to think about it for another few weeks. I also get exposure to folks that I normally would not meet. It costs less than doing it at home -- especially if the machines are designed to last less than a year and a half. I think that yes, the coral reefs are dying; the water is too warm. But there are areas where the water had been too cold, and now is just right. So all is not lost. But yes, we're losing it. I had the chance to live in Saudi Arabia for a half year a while back and go diving in the Red Sea. Some of that coral at low tide gets exposed to air and blasted at 45 degrees C. The water temperature gets really warm but those reefs are still thriving where they aren't stressed by some external insult. That coral is adapted to it. Coral will survive, but I think the issue is the transformation will be too fast and our never ending stress on the environment will limit how new ecosystems pop up as climate changes. Just like CO2 was way higher in the Earth's past than it is now, currently shellfish aren't adapted to it and it will take time for adaptations to establish themselves. Gail will be making a new post that kind of sums up why the entire discussion above is not all that to the point. I encourage you to read her post when it comes out this week. "It's socialism or bust." - Salon, insert in this article. We may as well bust, then, because government-imposed socialism is demoralizing theft and only leads to failing productivity. If the whole word turns to socialism, we will revert to the dark ages. If we are to remain a modern, innovating people, then those who only leech from the productive and expect a free ride will have to be in a separate financial system from those who produce, advance, and innovate. Otherwise, the burden of supporting the growing dependent population will outstrip the ability of those who are productive. The more innovative, productive people are having children at below replacement rate, while less productive people are having many more children than replacement rate. Because of inevitable demographics, this will lead to collapse of a socialist global system. Then, the masses of unproductive people will be in dire straits and the productive people will be gone or cloistered in a small enclave somewhere, away from punishing socialist taxation. For reference, see South Africa, Zimbabwe, Venezuela, etc. I would have thought this would be clear to most people here at Peak Prosperity. Odd that this bit from Salon, of all places, was included in a piece here. Am I missing something? I must be. Could you please explain to me what "productive" means and what "productive" people are "producing" and tie this back into primary natural resources, to support your argument? By productive, I mean people who produce some benefit to society or the financial system, whether that's the grandma who watches her grandchildren so their mother can go to work and the kids don't have to go to daycare, the stay at home mom who does a good job educating her kids and instilling values in them that benefit society and produce good citizens, or the working man, or the teacher or the taxpayer, or the innovator or researcher who invents new things, or the artist or author who enriches our lives, the clergy, the LEO or service people who protect society, the students working to prepare themselves for vocations, any sort of people who benefit society and/or contribute to the tax base. The poor and homeless could also be counted in this if they are of good intentions, raise their children with good intent, or otherwise bring joy and value to others in the ways that they can. Legal immigrants who come here to start a business, work in the professions they are trained for, or to get an education to later contribute to our nation and economy are also productive. What is not productive are people whose goal in life is to game the system and get as much out of it as they can without making any social or financial contributions in turn (like my sister), or illegal immigrants who come here to take advantage of entitlements they've not paid into and are unemployable or criminal in nature or intent. As far as primary natural resources, I assume you mean miners, farmers, water quality specialists, forestry or fishery people, as well as energy and transportation infrastructure? Yes, all the people who work in those fields would also be counted as productive. Productive people are producing a value or service to society, as opposed to those who through opportunism and selfishness, only seek to take from society or worse, to harm the innocent in doing so. Bernie Madoff comes to mind. Of course, there are those who through disability or health or age are no longer productive in a strict numbers sense (like my mother), but they are not malicious and there should be charity or family to support those who are non-productive through no fault of their own. I hope this answers your question. In terms of our future declines in Economy, Environment and Energy Flint, Michigan today is one potential future some or most of us will experience. I've started a documentary on Netflix that I highly recommend to you to help get your mind around what lies ahead for some of us. The title is "Flint Town" and it's available on Netflix. It's told from the perspective of police officers serving the decaying city while their manpower shrinks dramatically. The number of sworn officers in their department has plummeted from 300 to 98 today. Various officers state that they're sure that no one in US law enforcement has it as bad as they do and I can understand why they feel that way. But I can also tell you from experience that there are other cities where it's just as bad and even more cities in which certain neighborhoods are just as bad. The only question in my mind is how fast the rest of us get to Flint-like conditions and worse: gradually over decades like Flint, or relatively suddenly like Caracas. OK, that's a good explanation of what "productive" people do, on a higher level. Since most of those things you mention receive no monetary reward, then why is it that they cannot be part of a socialist system. If anything, you'd think they would flourish as people try to avoid a "punishing taxation system". A number of years back, I went through four GE dictaphones in a pretty short period of time. I purchased them because they were inexpensive and locally readily available. Big mistake. After researching a whole line-up of GE products and finding out they were almost all disasters, I vowed I'd never buy GE again. Comparable Sony products lasted 3-4x as long and also had at least double the battery life. BTW, when researching washers and driers to replace old Sears machines that were over 25 years old, I decided to buy Speed Queen with manual rather than electronic touchscreen controls. So far, so good. Here's another one. Had two different Subarus in our family where the head gaskets went south way before 100K miles. Checked around and found that this was an engineering problem with poorly designed head gaskets. The Subaru rep tried to tell me this was a weakness of the flat four engine design. I told her, wrong, VW and Porsche made flat four engine designs for years and never had this problem to this extent. I pushed the issue (having had 5 Subarus in our household) and eventually got Subaru to pony up $500 for the head gasket repairs. In purchasing various goods and services in recent years, I've come to formulate the First Time Failure Law: "In the modern age, NOTHING is done right the first time". Assume whatever you purchase or have serviced or fixed, there will be a problem. If not, consider yourself very fortunate and having beaten the odds. 1) People are emotion, not rational. Expect them to act accordingly. 2) When dealing with governments or corporations, assume they are lying to you unless it can be proven otherwise. 3) Whatever level of government you are examining, whether municipal, county, state, federal, or international, assume there is corruption unless it can be proven otherwise. 4) Any time your government tells you something is temporary, it'll become permanent unless it can be proven otherwise. 5) Any time governments or corporations tell you something is for your own good, for your safety, for the children, etc., watch out. It's usually the opposite. 6) When registering a complaint to governments or corporations and you're told, "No one else is having this problem", assume they are lying and many others are unless it can be proven otherwise. 7) When you are in a phone queue and you hear, "Your call is important to us ..." realize that is isn't. Otherwise, they wouldn't be keeping you on hold forever and playing that infernal music designed to maximally irritate you and hopefully get you to hand up while you wait. There are others but these come to the top of my head. Mark_BC, Most of the things I mentioned are jobs with income. Of about a dozen things I mentioned, only about 4 were services to society which were uncompensated. And even then, some of those enable others to have a job which contributes to the tax base. What kind of society are we envisioning, where people have to try to avoid a punishing taxation system? Not a good one I'd want to live in. You describe a system where everyone is trying to avoid working and contributing to the tax base. Where, then, will all the free stuff for everyone come from? None of that even matters. Productivity crashes in socialism because why would Bob want to bust his @$$ sweating and working every day when he sees Carl sitting back, fat n happy, doing no work at all, yet benefitting from Bob's labor? Bob will quit working, just like so many others have throughout history, if the work does not benefit him to any substantial degree more than Carl, who doesn't work at all. Socialism has never worked, but people who want free stuff off the backs of everyone else keep trying to implement it. You could point to Europe and say socialism is working there, but look what it's brought in... Invaders to consume all the benefits without contributing. Look into how many middle-eastern invaders into Germany are employable or employed. Almost none of them. And the people of Europe are starting to protest. Rather than arguing, lets you and I sit back and simply watch what happens in Europe over the next few years. Europe has often been a failed socialism experiment. I don't see why this time will be any different.
" McMansions will have to end, replaced by much smaller zero net two story homes whose roofs are a solar collector. " Net Zero Homes are very expense to build, unless you want to live in a tiny home. FWIW: I am building a near Net Zero of modest size and the cost will be over $500K in a Semi-Rural region (where labor costs are low). I doubt people will be able to afford them. Just to get the foundation, Septic, Well, Power (grid) installed cost about $100K. The SIP roof will cost about $50K for materials & install. Older folks will have issues in Tiny homes, especially if they are disabled or partial disabled. No way is a disabled person going to be able to use 18"x18" shower stall, or climb a ladder to get into bed. Solar collector systems aren't as easy as you think. You need to frequenly fiddle and it needs frequent maintanence. Americans can't be bother to do basic maintenance like flush their condensing boiler, change the air filter on their heat pump, or clean their gutters (or even call someone to do it for them!). Its getting to point where Americans need to hire someone to change a light bulb.
" Planned obsolesce will have to end. incorporate that with a combination tractor (for your lawn say) and car or pick up truck that can tow a small RV (your first home in the future) all of which will last for a lifetime." Sounds like the Homer mobile from the Simpsons! /joking. With the exception of a lawn mower, such a vehicle that can operate as car, a pickup truck, and can tow a RV already exists! Its called the Pick up truck and millions are sold every year. Older trucks have been known to last for decades. A diesel Pickup truck can last 300K or more miles. But sadly purchaing a new Diesel Pickup will cost at least $50K, and they stopped making Pickups with manual trasmissions a few years ago. If your lucky an Automatic will last about 150K miles before it needs to be rebuilt\replaced. can be done. And, while it may not be net zero, it will be ALOT better than standard. I have been doing retrofit here, on a very low income. I agree that the tiny homes of a couple hundred square feet are not practical. There is a huge range of houses sizes between that and a McMansion. Besides the impracticalities for elderly, if you need to provide for your own needs, you just need more room. It doesnt all need to be heated room, but room to store your canner, sewing machine, cases of home canned foods, etc... is not done in 100sq ft tiny home. The Americans who raised me, my grandparents, lived in a near net zero soddy in northwestern Iowa. I am sure your your techno marvel home is FAR from net zero. I have stayed in a few places built with earth, and I have done some retrofit work with earthen walls here, our semi-detached cabin ( Cob ) we did here is very comfortable, heats with a few sticks of wood. If it had more than 1 person in it, just body heat would keep you alright, but a few sticks of wood are nice if you can get it, and it is all over the ground around here. We built those walls by hand using the soil here, onsite. But, given this time and place we did put in windows and a door, salvaged. It has been here doing well for 15 years, never even got around to plastering it. Foundation is stacked rocks, a bit of cement between, since it is cheap and easy at this time and place, but could have just used more cob, it is the fitting of the stones. But, we also have alot of existing housing stock, so making it more comfortable with some energy retrofit is a good thing. I will blend things, like a pre-existing screen porch with no insulation ( but framed and roofed) we insulated the outer wall with light straw clay, then plastered with mud. back part of garage that we wanted insulated, leave the plywood sheathing, inside infill between the studs with the light strawclay, and plaster the inside with earth plaster. mntnhousepermi Wrote: "My solar has never needed constant fiddling, actually none at all." Solar electric or Hydronic Solar heating\DHW? Do you have a Solar with Batteries, or just using a grid-tied system? Retrofitting is better than nothing, but has severe limitations. To properly seal the home, it would basically have to be fully gutted, which is more expensive because you pay for the labor to gut it, and the labor to rebuild it back again. A high efficiency home will have very low air leakage. That said I suspect the majority of home owners don't have the funds to do a retrofit. A lot of people are underwater with their homes when they bought or upsized during the 2003-2008 housing bubble. Now Home prices are once again "astronomical", while wages have stagnated or declined.I don't think most people will spend $30K to $100K to retrofit a home today when the payback is could take as long as 20 years (at current energy prices). Of course you and other PP readers know that sooner or later energy prices will march back up. But the Majority do not. I have solar electric with batteries, and grid tied, I have had this for 18 or 19 years. The original batteries did need the water checked monthly, bu the newer batteries do not and the new batteries can be run down to nothing without degradation. This system has been very robust, no fiddling. While I like the heat given off of floor hydronic heat, that type of system is too expensive for me, too much tech and ripping apart of the house would have been needed. I have beefed up the passive solar gain, and if I wanted more, I would put in a homemade thermal air panel on the south wall, and this is very inexpensive. On the east side of the house there was a screen porch, and I retrofitted the south end of this to be a greenhouse/heat collector by taking off the shingles and putting clear corrugated, and then a wall and door from the larger part of that "room", this small green house is then at the south-east corner of the house, and by opening a door I can let the heat into the house. This was very inexpensive and more than gives back what was put in. People here pay more just to build a small greenhouse, many houses have a porch or deck area that can be retrofitted this way to a dual use greenhouse/heat, and it is very inexpensive DIY project. Another thing I did, when I replaced the old sliding doors ( These face due magnetic south and open into the main living area) is that I made sure to get sliding doors without low E coating, it did not cost more, I just had to wait for the special order, they are dual pane, etc.... People already are replacing old and broken windows and sliders on the south side of their house, the house I live in was built in 1972, houses this old are having money put into them by the owners, might as well, with just a bit of thought, make the house work better while at it ! When flooring is replaced, which it is all the time as old flooring wears out, it can be replaced with flooring with mass in the rooms with the south facing windows. When window coverings get updated, they might as well spend just a bit more and get shades that keep in the heat, and keep out the heat in summer. When the roof wears out and needs replacing, might as well get a roof that helps keep out the summer heat. So, I put on a metal roof with "cool roof" coating under the color coat. Other retrofit items depend on the location, because of where I live, I found a used, modern, very low emmission wood stove ( it has a catalytic converter) to replace the old one here. The main house is down to 1 cord of wood a winter, my first winter here we bought 4 cords of wood. If I lived back in my previous house, I would consider having it go back to the old way of 2 locations of stand alone heaters, and ditch the central air duct driven central heater that is very wasteful. The cabin here either burns a few sticks of wood or electric heat, and the earthern constructions means that even if the electric is used, it is just a couple Kw hours a day, we have been monitoring and ran it that way for a few weeks in very cold weather. I dont know why you think people have to spend so much money to energy retrofit, there are many very, very effective measures that are very cheap. That is why I put in the link to the half project and build it solar, to give DIY ideas, and because the charts show the cheapest things done for huge paybacks. One thing I find in the general public, people think insulation and windows, probably because of the companies that look for work doing these things. Air infiltration causes a huge amount of comfort loss and energy loss. This is a DIY project that is very inexpensive. I actual have not finished this as I have had health problems and cannot get on a ladder and caulk the spots need right now. But, I did get the rim joist area done in the crawl space. I actually made the crawl space a conditioned space very cheaply, I hired out the Clean Crawlspace crew to do the vapor barrier part, and I said "no" to every add on, then a local handyman helped me close of the vents and insulate the rim joist area with cut out blocks of ThermaMax insulation and spray foam. Others could do the whole thing themselves, it is not hard and made a huge difference in comfort. Other people with an attic just need to air seal all penetrations under the insulation, and add another layer of insulation, both DIY jobs. In hot areas, getting a roll of radient barrier, and a staple gun and scissors, is only a couple hundred on a larger house to put that across the underside of the roof rafters, no need to wait for when the roof wears out to keep that heat out of the attic ! Socialism has never worked, but people who want free stuff off the backs of everyone else keep trying to implement it. That would describe the uber rich, who's majority of income is "unearned", i.e. money earned off their money. That money, for the most part (such as dividends and stock price increases), is generated by working people. The uber rich expect a return on their money. How is that not a form of wanting free stuff off the backs of working people? Hello, i has been visiting this site for some time now, a couple of years, and i have learn a lot, thanks for this great job. I live in Venezuela, when i read the sentence "It’s socialism or bust" in the post, coming from some who is identified as a political consultant, 32, who probably live in a rich country (thanks to capitalism) i feel like someone walked over my grave, a person who must now about politics, who probably has some knowledge about whats happening in my country right now, and is about my age, and is capable of believe this! obviously has never live in a truly socialist country. It is not "socialism or bust is" It’s socialism and bust, because a bust is the only final possible to socialism, claim that you can solve de problems of inequality, pollution or anything else with socialism is like cure the flu drinking a lot of cyanide. My message to anyone who want lo listen, socialism is never a solution, leave nothing good behind, Churchill was absolutely right about it, if you want evidence, spend a week on Bogota, Lima, Quito, even Santiago de Chile, and then visit Caracas, before socialism (and i am not saying that we were a truly free market capitalist country, we had our own portion of leftish and populist politics), million of Colombian, Peruvians, Ecuadorians even thousands of Chileans came to Venezuela looking for a better life, and most found it, now look the situation, thanks to socialism. Thanks for sharing, friend! Many here enthusiastically agree with you and I'm certainly one of them. And we must always remember that Lenin said (or was it Stalin? ), "The purpose of socialism is to usher in communism." I actually agree with you. Like a lot of things, socialism sounds great in theory but it doesn't actually work. Socialism always fails. We all know why -- it provides no incentives for anyone to innovate and strive to do better, and the government cannot centrally command a market. Genuine pricing signals are required. Free market capitalism also inevitably fails. The best example from history is the United States which failed around 1970-71 (when it hit Peak Oil and completely coincidentally (wink-wink) ended the gold standard as its trade deficit ramped up). What it has morphed into now is about as far as you can get from socialism and when I hear people criticize the current system as being socialist I just think that they don't understand what they're talking about and they certainly don't understand what socialism is. While this isn't free market capitalism, it is the inevitable end result of free market capitalism. Just because socialism doesn't work doesn't mean that capitalism does. There is a saying something like, "Capitalism's vice is unequal sharing of wealth. Socialism's vice is equal sharing of poverty". Capitalism doesn't work because wealth inevitably concentrates which sends the middle class into poverty unless the economy exponentially grows and "creates" new wealth, and everyone here should understand where that wealth really comes from. When the economy can no longer grow due to resource constraints the system falls apart and corruption runs rampant. Interesting how the US and Russia are now so very similar. They started from polar opposites but now have become the same: an oligarchy of a few very wealthy elites who control the markets and siphon wealth from the masses who are struggling to get by. Earning money off your money is not 'unearned.' If I have money that I've either inherited or earned, and I invest it in builing an apartment building, which then creates housing for people and earns profit for me, how is that unearned money? If I have money set aside for retirement and I invest in the market, and I make a return on my investment, how is that unearned? Investing in the market does not deprive the working people of their wages, on the contrary, it helps the company to grow so that it can employ more people and serve more of the market or cummunity. Money is inanimate. It's not going to choose to invest itself. A person has to take their money and intelligently and actively do something with it. The act of being smart with your money and investing it in something that will earn more money does not make the result 'unearned.' Keep in mind, investing carries risk, and not all money invested earns a return. Many ventures fail, many stocks crash. If I have the same money I would have built an apartment complex with, yet I instead go waste it at the casino, is that somehow better than if I built something with it, or invested it to make more money? Please explain how investing for a return of profit, or investing in the market is harming the working man. The working man is going to make his wages, and no part of my investment profit is withheld from his paycheck, so how do you figure that smart money management is harmful to the working man? We are so similar, in fact, that I think we should be allies, not set against each other. I don't have a solution, other than to return to a more free market than we have. And to make sure my family is prepared, come what may. I don't think we're meant to find perfection or paradise on this earth, so I don't expect to find the perfect system for government or money. All we can do it seek out and correct the obvious problems where we are allowed to do so. If I had to choose a perfect system, I'd go back to before we had kings and follow the commandments of the Lord. It's when we asked for corrupt human leadership that we ushered in many of these failings. Humanity will always default to taking the easiest path, and to taking advantage of any loophole that can be found. As long as we're under human leadership, things will be far from perfect. If human decency were common across the board we wouldn't have these problems, but we live in a far from perfect world. "Please explain how investing for a return of profit, or investing in the market is harming the working man. The working man is going to make his wages, and no part of my investment profit is withheld from his paycheck, so how do you figure that smart money management is harmful to the working man?" Oh but it does, I feel it in my soul. Those who are rich, savvy, and make their money by manipulating and gaming the system are not so innocent and benign as you portray them to be. Computers placed strategically so they can gain fractions of a second in order to give someone an advantage, algorithims to game the system, stock buy backs, shipping jobs over seas, replacing jobs with robots in order to make bigger profits. There is a humongous difference between a carpenter and a trader using the most high-tech, insider information to enrich their pocket-book. I know I am not very articulate in this area but when my taxes on a days work which is PHYSICAL labor are higher that the rich persons gaming and manipulations no argument on earth is going to convince me they "earned" that money. Lets watch the movie The Big Short and then someone can explain to me how no-one got hurt and the working man isn't affected by the markets and the rich are enguenious. Perhaps I misunderstood the movie. Lost me at "I feel it"
AKGrannyWGrit, I'm sorry, but you lost me at "I feel it in my soul." I don't trust people's feelings to be the rational basis for truth. I have to question even my own feelings on many issues, so it's nothing personal against you. swampmama, lost me at "lost". Swampmama, you lost me at the word "lost". Most of what GrannyWG said was checkable fact, including possibly the conclusion (depending on what points the film raises). So when you say "lost me", you let me know that you are discounting everything else, all the logic, on the weight of her having a feeling different than yours. A better reply would discount the feeling, then go for the meat of her comment. Just a comment on rational discourse and dialogue, trying to keep things to a valid level. "Unearned income" is how the IRS refers to it. "Earned income" is what they consider money received as a result of work or a job. Both terms are accurate and revealing. 2. If I have money that I've either inherited or earned, and I invest it in builing an apartment building, which then creates housing for people and earns profit for me, how is that unearned money? Believe that is how the IRS categorizes it (rental income, anyway). Providing housing is more beneficial to others than buying stock and collecting dividends, and being a landlord certainly involves work. That is why I said "for the most part" and specified "dividends and stock price increases", as I don't consider landlord income to be unearned or undeserving. It should be pointed out there are slumlords, however, who abuse and endanger tenants by cutting corners in the name of increasing profits (an inherent fault of capitalism). The recent fire in Trump Tower is an example, where sprinklers were not installed in order to save money and someone died as a result. 3. If I have money set aside for retirement and I invest in the market, and I make a return on my investment, how is that unearned? Investing in the market does not deprive the working people of their wages, on the contrary, it helps the company to grow so that it can employ more people and serve more of the market or cummunity. Again, a distinction made by the IRS, one I'll argue is valid. Your return is dependent on the labor of employees, and the more their compensation is cut, the greater your return. The idea that "investing" in companies leads to growth and increased employment maybe once upon a time worked in the early stages of a corporation's formation, but it clearly doesn't play out these days. If anything, the opposite is true. For decades, meeting shareholder demands has led to reduced benefits, pay cuts, and offshoring of jobs. Keep in mind the overwhelming majority of shares are held by the top .1%. Also, most stock transactions bypass the companies involved. "Investors" only care about a company for the return it provides, and won't hesitate to dump it as soon as a better investment appears. 4. Keep in mind, investing carries risk, and not all money invested earns a return. Many ventures fail, many stocks crash. Without question, and the best justification for getting a return on investment. Far better than the false notion of spurring innovation, employment and prosperity. 5. Please explain how investing for a return of profit, or investing in the market is harming the working man. The working man is going to make his wages, and no part of my investment profit is withheld from his paycheck, so how do you figure that smart money management is harmful to the working man? Mostly addressed above (#3). For clarification, a large part of your investment profit is in effect withheld from the working person's paycheck. I.e., instead of profits being shared among those who generated them, they are being distributed to you and other shareholders. If you're inclined to say that's the way the system works, I would agree and argue that is why the system has to be changed. The big question--one that rarely gets asked or discussed--is how is it fair that the wealthy get to live off the money made off their money while working people live off their paychecks? Assuming the .1%'s wealth was honestly and deservedly earned (highly questionable, as compensation has gotten completely out of whack...is it even possible to do $100s of millions, or billions of $ worth of work? Not to mention those who inherited it. ), how can it be justified that they get to live like royalty without spending any of the money they "earned", instead living off the money their money makes? A person who works every week has to save up to buy a kayak, while the uber rich buy yachts with their dividend checks. As if this weren't crazy enough, we tax unearned income at lower rates than earned income!!! We've been fed this narrative about how the .1% are job creators and the most successful members of society, and as such shouldn't be penalized by high taxes. We should instead be talking about how the working class are wealth enablers (enabling those at the top to acquire such vast wealth) and the sense of entitlement among the .1%, expecting to live off unearned income and buying politicians to game tax laws in their favor. At 1/2 cent or 1 cent per stock trade, per share. This only affects the constant manipulative trading to any extent, and it would go along way to take care of our national debt. At the core - ideally - capital represents people who don't spend all they make, while labor represents those who do spend all they make. "Those who care about saving" vs "those who don't care as much." Ideally. Capital also takes risk, while labor does not. Without capital and its willingness to take risk, there would be very little creation. Without labor, nothing would get done. Both are necessary. My mom was a saver. Over her lifetime, she accumulated capital. Following in her footsteps, so did I. As always the answer isn't "capital should win" or "labor should win" - ideally there should be a balance in sharing the rewards of production between labor and capital, assuming we want relative stability in society. When labor gets too strong (read: socialism) and takes too large a share of the rewards, capital flees - either out of the country, or into hiding. When capital gets too strong (i.e. globalism) and takes too large a share of the rewards, labor gets upset and brings about political changes - socialism, communism, Donald Trump, etc. If we worry now about socialism coming to the US, understand that it is happening because capital has had free run of the place for the past 25 years. Labor has not had a voice since the Democrats turned into Social-Justice-flavored-Republicans back in 1992, tipping the political scales inexorably towards Capital. There's even more complexity, though; centralized Monopoly Capital stamps out Small Business Capital wherever possible - creating more wage slaves and eliminating competition. An example: US corporate megafarms, via NAFTA, kill off family farms in Mexico. Amazon is another case in point. And of course I'm ignoring - for the sake of this discussion - how central banks have betrayed people like me and my mom by printing money. But that's for another time. Okay so you discount my post because you discount my "feelings" Let me provide the following video as evidence to support my feelings of frustration to unfairness, indifference and apathy. As I am not as articulate as many of my fellow PP members to support my argument and position please re-read posts 46 thru 50.